With only two months left of 2018, it’s time to start reviewing our trades over the past year, and ask ourselves some questions about where we stand right now. Are you where you planned to when you set your goals for the year in January? If yes, that’s great! If not, why? And what can you do over the next two months to ensure that when 2018 ends, you can look back and say to yourself that you have worked hard, learned something, and improved yourself as a trader this year. Today, we’ll look back to see what happened with some of the markets we analyzed last month, while also looking into a few new trading ideas that are setting up right now. The most important event in the markets during the last month was undoubtedly the crash in stocks globally, led by the S&P 500 index in the US. 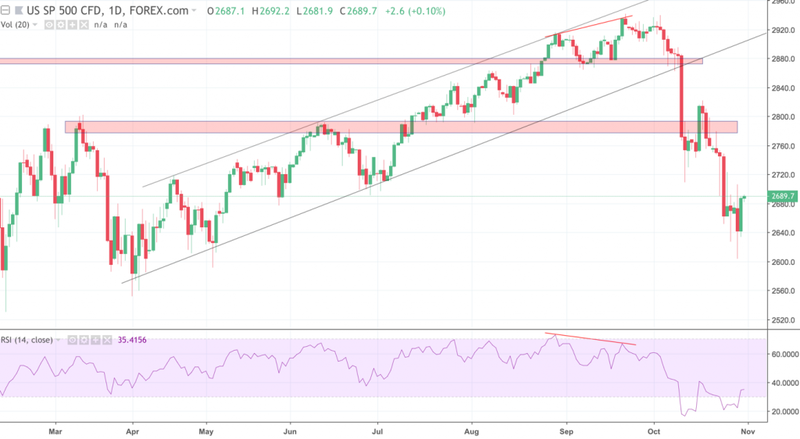 As it turns out, we were spot on when we warned about an obvious divergence between the price and RSI of the S&P last month. A few days after we published it, the S&P plunged by nearly 4% in a single day, and it has been accompanied by even greater losses since. As of this writing, the S&P is down about 8.5% from its all-time high in late September. The sharp sell-off in stocks this month brought the S&P well below the lower end of the trading range it has stayed within since April this year. Because of this, it is very likely that the coming weeks and months are going to be significantly more volatile than the past few months have been. It’s difficult to tell where this market may be headed next now. From a technical standpoint, however, the lows from the corrections in February and March around the 2,580 level appears to be a natural support area. If price breaks down completely and goes below that level, the next support area would likely be around 2,570, indicated on longer-term charts by the consolidation area between August and September 2017. The US dollar has been surprising to watch this month, as it certainly looked like it was going lower, but then instead reversed sharply to the upside. When we look at the strength of the US dollar, a nice chart to look at is the US dollar index (DXY) instead of using any of the currency pairs involving the US dollar such as USD/AUD. With DXY, we can see how the dollar has moved against an average of several major currencies, which gives us a better picture by excluding country-specific events relating to other currencies like the Aussie dollar or the Kiwi. 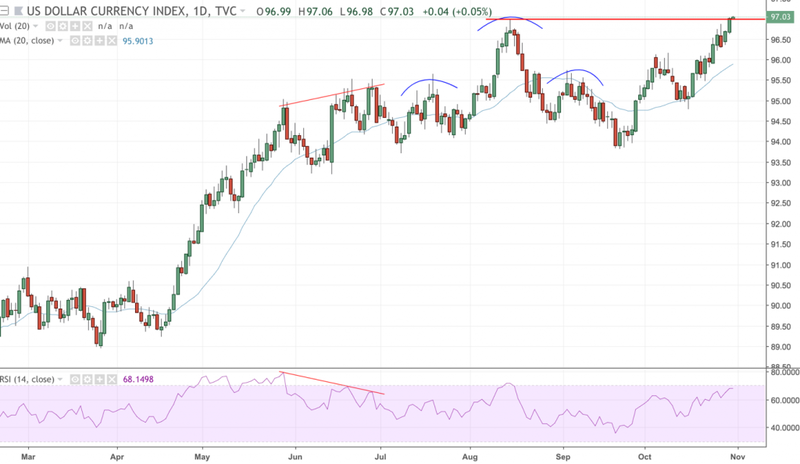 Unfortunately, the head & shoulder pattern we pointed out last month on DXY only worked out for a very brief period of time, and the US dollar index (DXY) is now testing its previous high from August again. There has been quite some demand for dollars last month due to its perceived safe-haven status during stock market sell-offs, and this is one of the reasons why the dollar has continued higher despite the negative technical picture and the troubled US stock market. 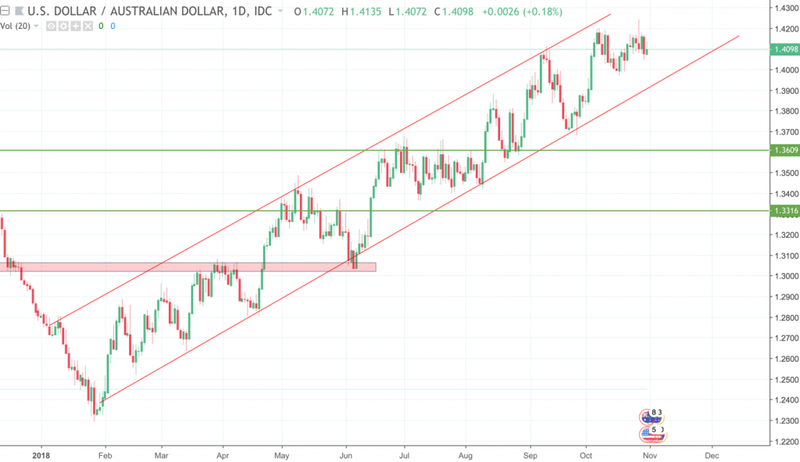 A confirmed break above the red resistance line on the DXY chart would be a very bullish sign for the US dollar, which may translate into nice trend trading opportunities on other USD-related forex pairs. 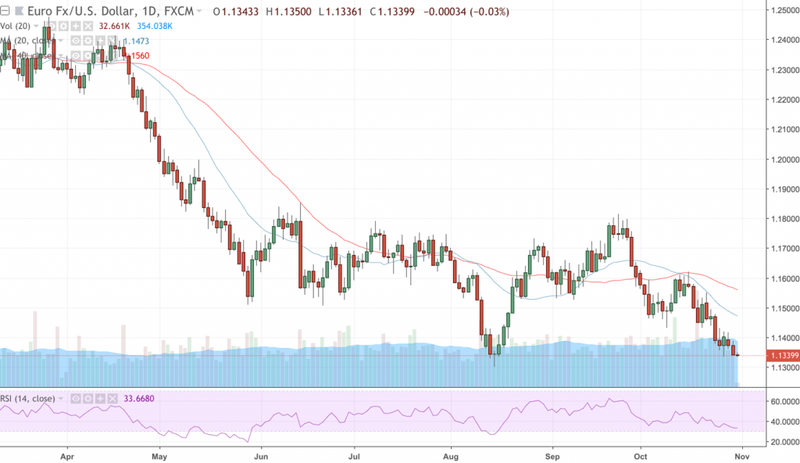 One currency pair that could potentially give us a nice trade this month is the popular EUR/USD. Looking at the longer-term weekly chart below, it’s easy to see that this pair is right now testing the support level from its previous low in August. 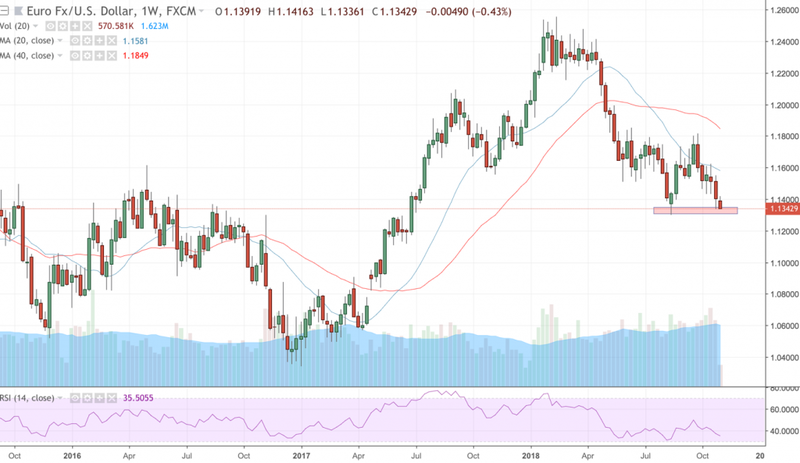 If the pair breaks lower, we may be set for a prolonged bearish rally for the EUR/USD, with the next significant support level being the 1.060 to 1.055 area. Another opportunity to bet on the continued strength of the US dollar is the USD/AUD pair. This pair has been remarkably predictable throughout the whole year, and is still trading within the relatively narrow uptrending range we drew up several months ago. As with any instrument that is trading within a range, the key is to buy near the lower end of the range, and to sell (or short) near to upper end of the range. This is a short-term trading strategy where the aim is just to catch each trend wave as it moves up and down, rather than trying to ride the entire trend. For buy orders, the stop-loss should be placed just below the lower end of the range in order to minimize risk should the pattern break down, while still ensuring you don’t get stopped out if the market just tests the support level. Remember that trading is a game of uncertainty. We never know how the market is going to move, but we take an informed bet based on probabilities. And with enough good trades, the probabilities will eventually play out in our favor. Therefore, don’t be afraid to pull the trigger when you see a set-up that matches your trading strategy, but always make sure you have a plan for what to do if the market doesn’t act the way you expected it to. « Previous Post Is Gold Staging A New Rally?